One of our most memorable experiences is having attended The Royal Edinburgh Military Tattoo. If you are a fan of history, especially military history, or if you just enjoy a great show, this event is not to be missed. It was an unseasonably cool night when we attended, and with the wind gathering, we were glad we had brought sweaters to wear under our windbreakers. The excitement was growing and the showground was largely dark when suddenly there was a roar. Not immediately, we realised we had just seen a Tornado jet pass over the grounds at about 600mph, signalling the opening of the show. 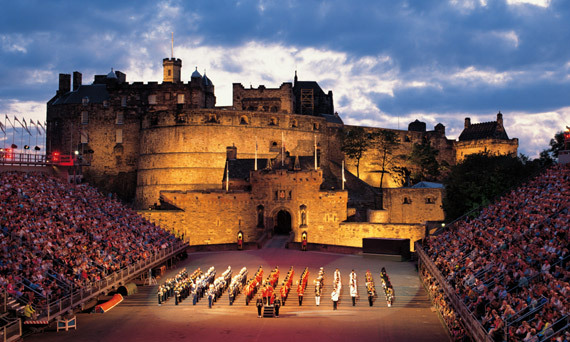 From its early days, The Royal Edinburgh Military Tattoo has been an international favourite. Performers from over 48 countries have taken part in the Tattoo, and around 30 per cent of the 220,000 audience each year are from overseas. Each year’s Tattoo is very much a ‘global gathering’ – showcasing the talents of musicians and performers from every corner of the globe. In addition to this, the Tattoo has been televised in more than 40 countries. An annual television audience of 100 million watches the coverage worldwide. The international flavour of the Tattoo has been deliberately developed as a key element in its capacity to entertain a huge, cosmopolitan audience. The Tattoo’s unique ability to bring together thousands of people for this annual celebration of music and entertainment continues and the public’s appetite for pomp and ceremony shows no sign of diminishing. We want you to experience this once-in-a lifetime event. The dates for this year’s Tattoo are 7-29 August, so book soon to avoid disappointment. The first thing you will want to do is secure a room, so start now and take a look at hotels in Edinburgh that fit your style and budget. Next, be sure to get tickets to the event, itself. For that we have a great option that takes you on a tour of the Scottish Highlands on a day trip from Edinburgh (including a fun stop at a Scotch distillery! ), returning you in time to see the world-famous Military Tattoo that night. The price includes the tours and tickets to the Tattoo. But why stop there? Edinburgh is a great starting point from which to sample all the delights of the Highlands and beyond, such as the Isle of Skye, Loch Ness, Sterling Castle and many many more. One of our favourites is Inverary Castle, home of the Clan Campbell, which can be visited on the West Highlands Lochs and Castles Trip. Whatever your taste, there is bound to be something to please. Just take a look at all the tours and excursions available from Edinburgh. And please let us know how you like Edinburgh by leaving a comment on Savvy Traveler Facebook Page. That’s enjoying your trip The Savvy Traveler way!